TrueTL indicators are not a complete trading system. 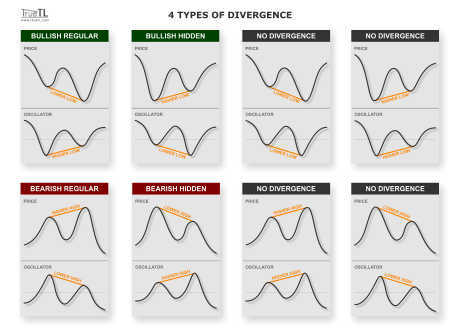 Our indicators "only" draw the trendlines, S/R levels and divergences with many options to meet the user's unique needs. The usage is similar as if you draw manually them. We would like to create a compact page here, where beginners can find only useful, choosy and basically required knowledge and advices about the trading, with example strategies, not about the dead end. The content is expanding continuously, so it's worth to visit again (but please note that we are a software developer not an education firm). decrease the possibility of mistakes - when we don't see a higher timeframe's trendline or a trend started earlier than it appears on our screen or inaccurated draws by hand, etc. Most of people are looking for a quick solution for the trading which can make unlimited amount of money. We can see some search keywords on our site such as: "100% sure indicator, accurate buy sell indicator, never loose ea, winner ea". if anyone say that "we will show how to earn 5000$ daily" why would they do that? if anyone can make a robot what never loose then why sell it for 50-150$? if anyone can make an indicator which draws perfect arrows to sell/buy why not make a robot? What would be the need for our activity for the trading? Shortly: only for your money! The Internet is full of ads similar to those above, thus if you see them you can be sure that these are fake promisses. Commercially available simple and profitable complete trading system or a good BUY/SELL/EXIT indicator (especially automated version) does not exist! if someone could develop something like these you can be sure he would keep it for himself silently.The trading is an individual and personal activity. 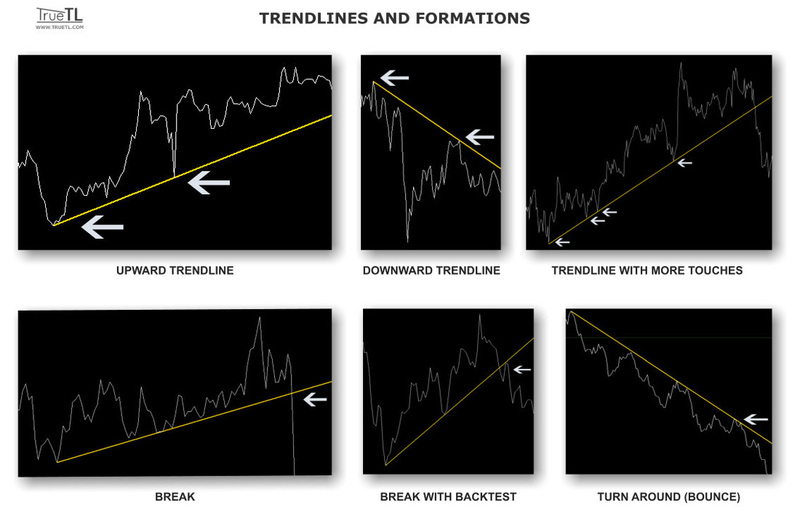 At the beginning you have to learn about the basic tools (trendlines, levels, candle patterns, etc.) 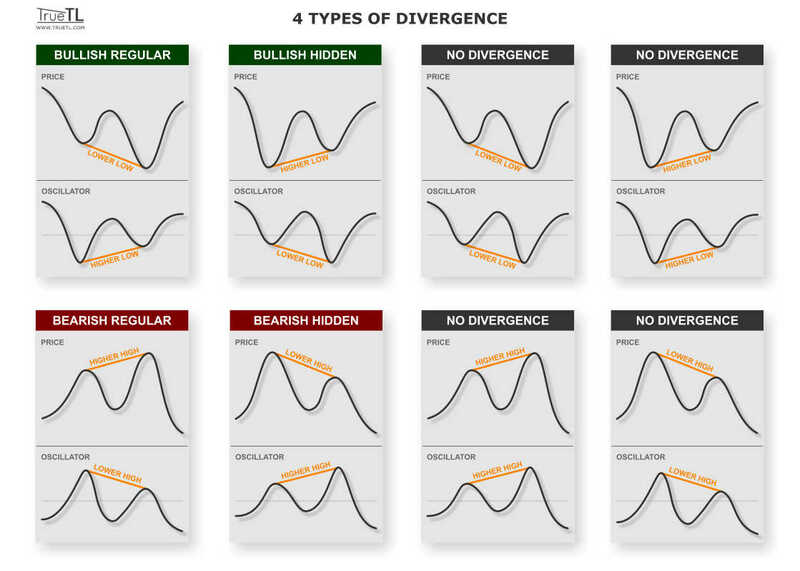 You can find many ideas on many websites/forums, but you have to develop your own complete trading personality, and your unique trading style. You have to build your own strategy with filters, confirmations, and money management with backtesting. It's hard work and requires a lot of time but never forget: free money doesn't exist. Most beginner traders enter the position without Stop Loss (SL) and believe that the instrument will go to the good direction. This can cause the margin call on the trading account, so any position without Stop Loss is absolutely not recommended. 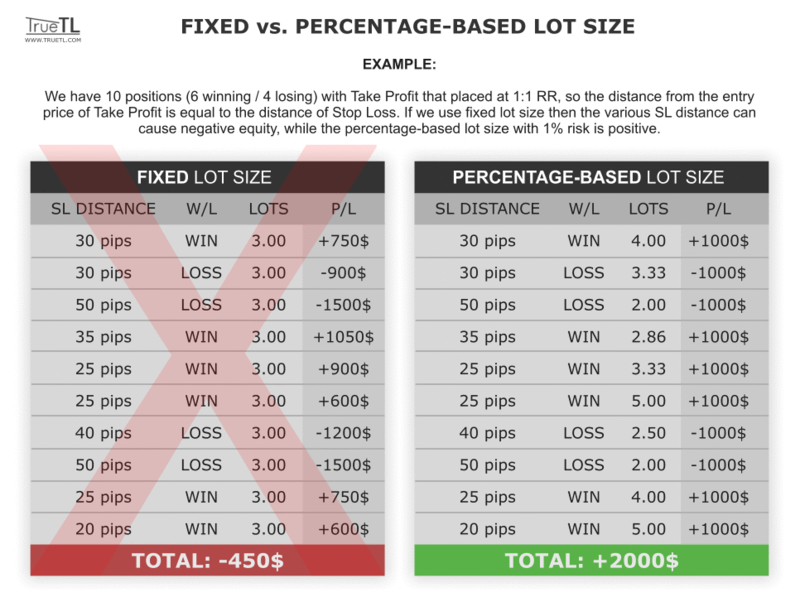 The professional traders can recognize the price from which their original plan is not good, so they don't risk their entire account, instead they realize the predefined loss. 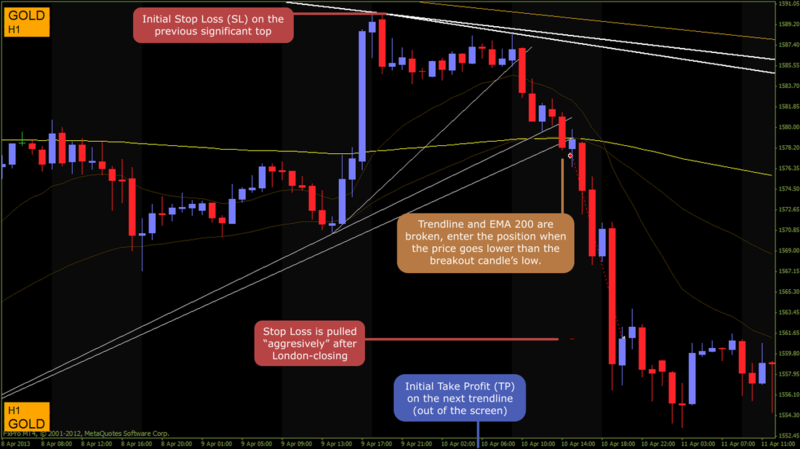 If we placed the Stop Loss, we never move it to the wrong direction, so never increase the initial risk. On many websites we can read about fixed amount of pips for Stop Loss for every position in any market situation, but we think that it's a wrong way, because the market is changing continuously. For example the EURUSD can move only 30-40 pips in a day, but sometimes it can move 150-200 pips. So we prefer the dynamically determined Stop Loss price on a previous peak/bottom, or pivot point, trendlines or S/R levels, etc. 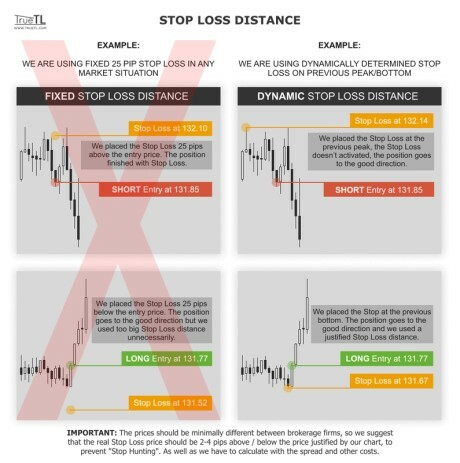 The prices should be minimally different between brokerage firms, so we suggest that the real Stop Loss price should be 2-4 pips above / below the price justified by our chart, to prevent "Stop Hunting". 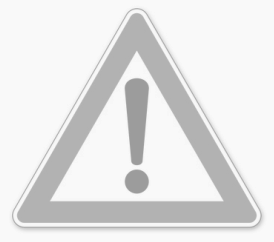 Another reason why we have to use Stop Loss always: it protects us from the instability of Internet connection or the power interruption or from any other technical errors. We look for the first price, from which the instrument might not move to our direction anymore. As the initial Stop Loss, this can also be a next trendline, S/R level, pivot, etc. 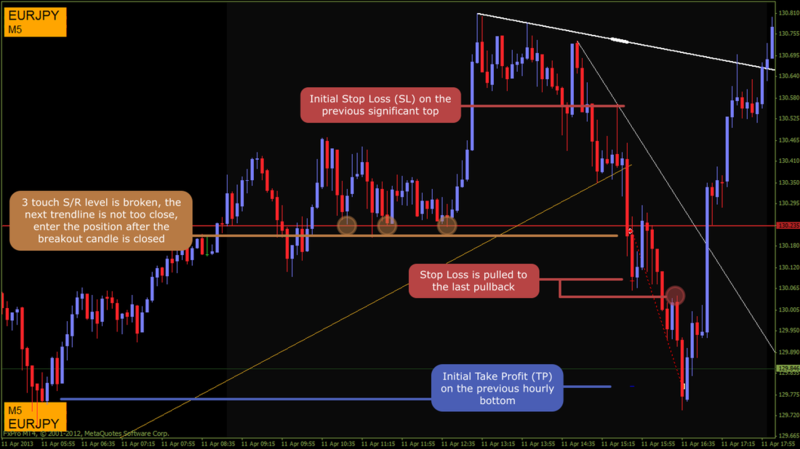 We can use Take Profit (TP) or close the position manually, it's less important than the using of SL. 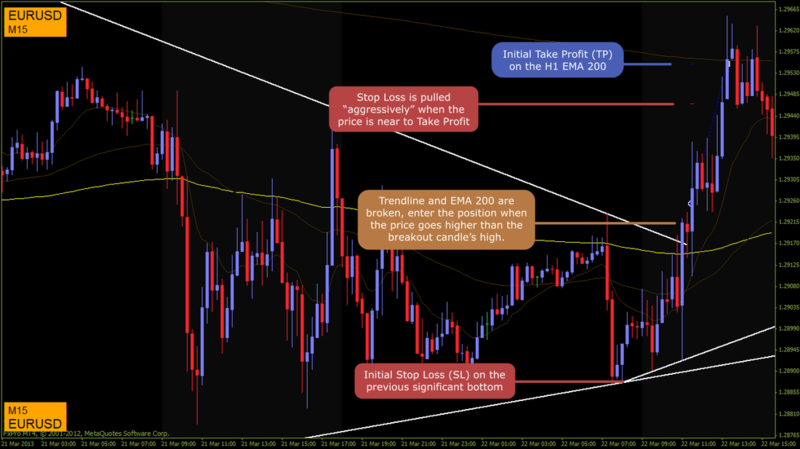 The risk is the distance between the entry price and the Stop Loss price. 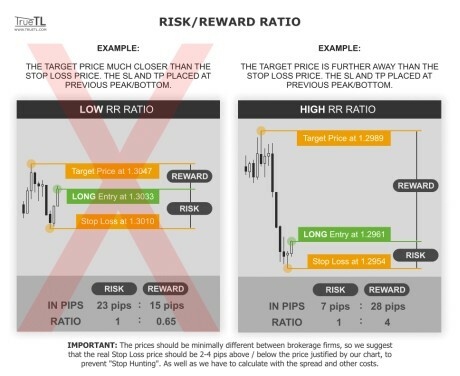 The reward is the distance between the entry price and the Target Price. 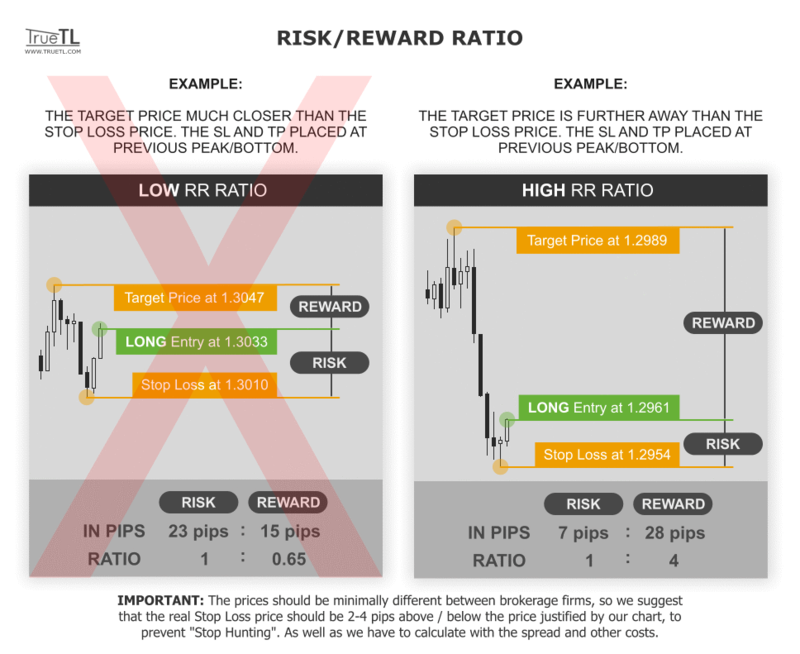 From these we can calculate the risk/reward ratio: if the Stop Loss distance is 40 pips, and the Target distance is 80, then our Risk/Reward ratio is 1:2, or if the Stop Loss price is 30 pips from the entry and the Target price is 10 pips, then our Risk/Reward ratio is 3:1. 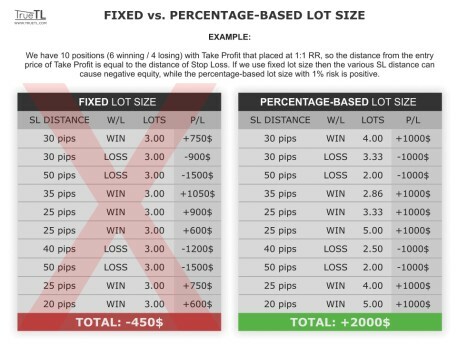 Basically the good RR ratio is higher than 1:1, but it depends on our entry signal's quality (hit rate) and our position management method (see below). We have to make statistics from these to know what RR ratio for our entry is required. Our account's equity. It is not the same as balance, because the equity contains all opened positions' profits and losses (floating positions), while the balance contains only the closed positions'. Predefined percentage of risk. We suggest that the maximum risked money should be 3% of the account's equity. 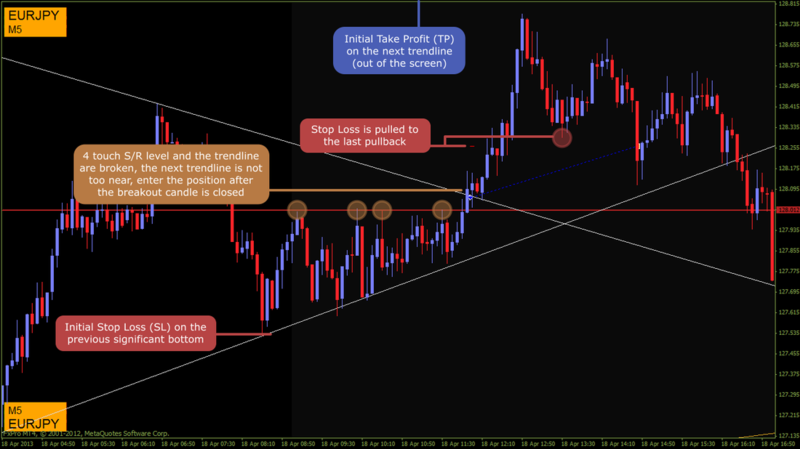 Stop Loss distance in pips between the entry price and the Stop Loss price. Tick value (Pip value) that shows how much change a point movement per standard lot can cause in our account's currency. For example: our account's equity is 10.000$ and we want to risk 1% of this. If the Stop Loss distance is 20 pips on EURUSD then we will open the position with 0.5 lot, but if the distance is 40 pips then with 0.25 lot (10000 X 1% / 20 / 10 = 0.5 lot and 10000 x 1% / 40 / 10 = 0.25 lot). We can make this calculation manually, but it's more comfortable, faster and safer to use a position management software such as our Free Infoboard EA or indicator. We can define a market situation when we will close the position for example if a reversal candle pattern appears, or if the movement slows down. It's a very good method to follow the market, but it causes a higher mental load, and requires continuous attention. Place the Take Profit and "forget" the position. It's a simple and might be a profitable method in long term, as well as it's comfortable, but with this method we cannot follow the changes of the market. 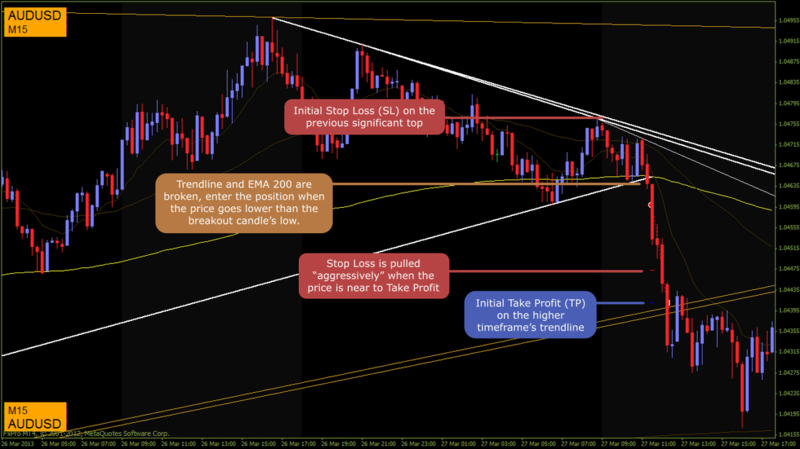 Move the Stop Loss if the position goes towards the good direction. We prefer the dynamically determined new SL price such as a new peak/bottom or a trendline, S/R levels, pivot points, fibonacci levels etc. instead of the simple trailing stop. This method is the middle-way because it causes a lower mental load but we can follow the changes of the market. We can define a market situation when we will Scale In (increase) or Scale Out (decrease) our position's lot size. With Scale In we can take higher profit if the market goes to the good direction, but it causes higher mental load and higher amplitude on the equity's curve. That's why this method is recommended only for advanced traders. At an uncertain market situation or at a first targeted price we can Scale Out the position's lot size, which decreases the possible profit, but also decreases our mental load. 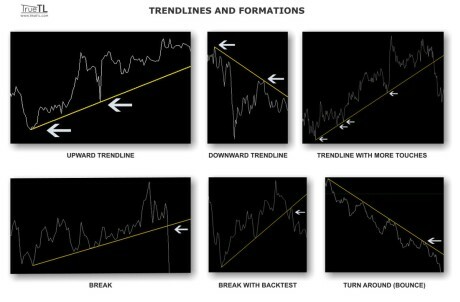 The trendline is a straight line that connects two or more price points or peaks and bottoms. This line facilitates the definition of trend direction, and in the future this line will behave as support or resistance. The more touches a trendline has, the more accurate it is, and the price action will be stronger. We can use the trendlines for many things. In most case the simple breakout on a shorter trendline (of course with some filtering) is maybe enough for entry. But the longer trendlines (so the higher timeframe's trendlines) require the backtest for confirmation after breakout, or we can use them for turn around. Furthermore the trendlines are good for price targeting or a Stop Loss place also. If you are a beginner trader, in this video we might can help you how to start the development, how can you think with TrueTL. The development and testing of your strategy is a long and hard work. We're just showing a possible way to begin, but you can find lot of other methods, it's up to you. We’re trading on the forex market since 2008, so we believe only in the traditional tools: peak/bottom analysis, S/R levels, candlestick patterns, trendlines, etc. We’ve seen a lot of seemingly simple strategy, magic indicators, promising robots, but we’ve never seen anyone who could earn money with them in a long term. You can find many description of strategies on many sites but the forex trading more complexed than some rules. In itself a "Simple London Breakout Strategy" or an "EMA Cross Strategy" with few rules can't be profitable in a long term, because they are not including some indescribable things (economy, "chart beauty", risk management, etc). These things can rewrite our basic rules sometimes, thats why it's impossible to write all of them, but we can share some of our rules to give you some ideas for your strategy development. We always use Stop Loss (SL) on the previous peak/bottom level (accurately above/below with 2-3 pips that prevent the "Stop Hunting"), and pulling it when the position goes towards to the "good direction" and the price make a new high/low. 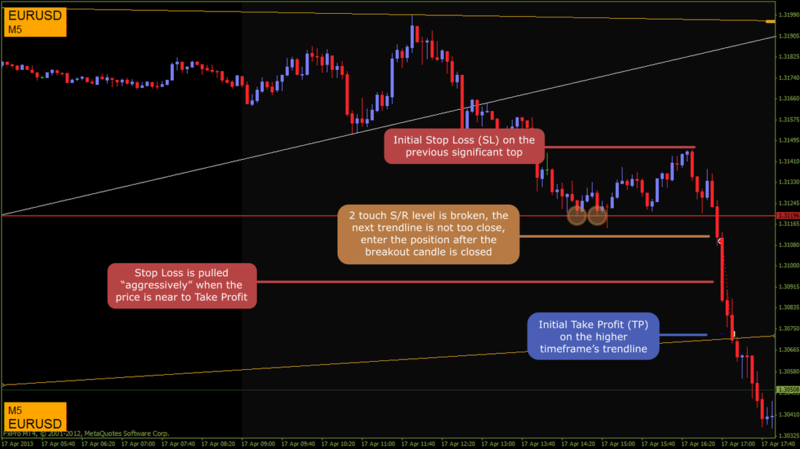 We always check the possible target price and in the most of cases we are placing Take Profit (TP). For example it can be a next trendline, or previous peak / bottom or EMA 200 or a very strong (more than 3 touches) level. The equity's risk is always max. 1% per trade. We are not affraid from the low/middle impact economy news release, because our systems are not sensitive for the "little confused" price moving (because the entry is strong, and the SL-TP place are good). But before a high impact news we might not enter to a position, or we close them if they running. Timeframe: M15 or H1, but good on any other timeframes. Instruments: EURUSD, GBPUSD, AUDUSD, EURJPY, GBPJPY, USDJPY, AUDCAD, AUDJPY, CADJPY, but good for any forex pair, cfd, stocks. Entry mode: pending-order or manually enter when the breakout candle is closed. 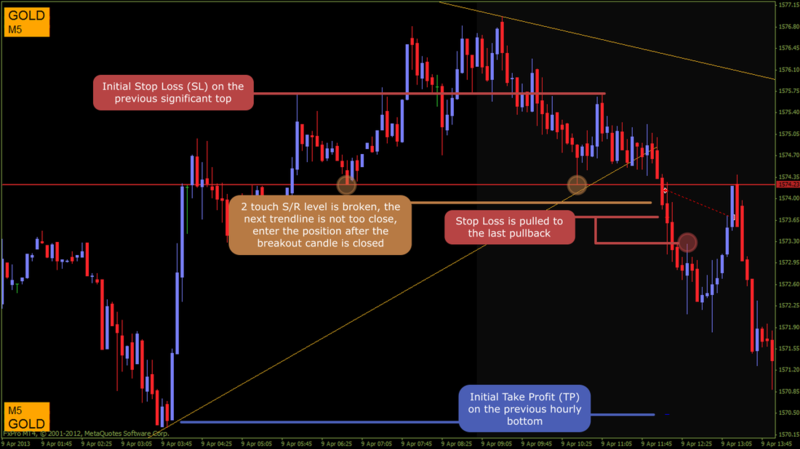 The entry price is below/above with 2-3 pips from the trigger candle's high/low for the confirmation. 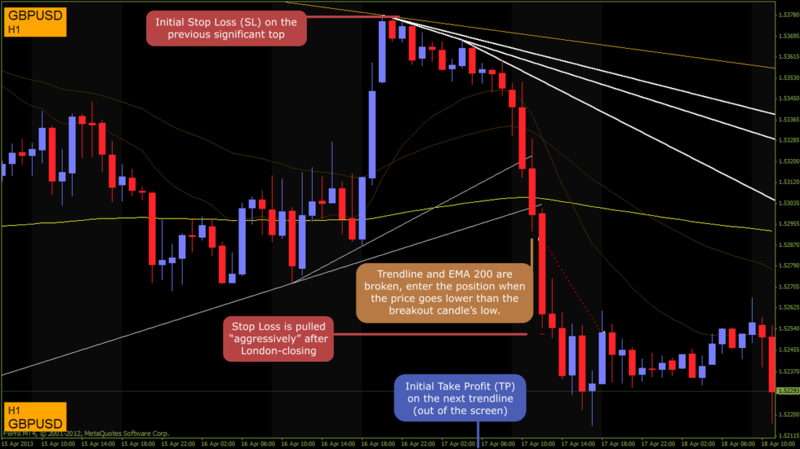 Trend determination: observing the place of multi timeframe 200 EMA (M1, M5, M15, H1). If the main TF's EMA is above, then we are looking for short entry only, when the EMA is below, we are looking for long. The other TF's EMAs are only the confirmation: if too close to the entry price, then we don't enter. Timeframe: M5 with H1 trendlines, but good on any other timeframes with the higher timeframe's trendline. Instruments: EURUSD, GBPUSD, XAUUSD, EURJPY, USDJPY, but good for any forex pair, cfd, stocks. Main trigger: entry if a 2 or more touches S/R level or a double top/bottom's neckline is broken (we're drawing by hand but TrueTL will contains this function). Entry mode: usually entry when the break candle is closed, but sometimes we are waiting while the price backtest the broken level. 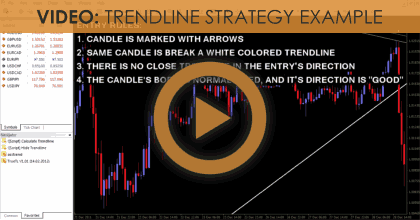 Trend determination: in this strategy we don't use any other method because if a strong S/R levels is broken, and the trendlines are good, than the actual timeframe's trend direction is reversed for us.